In China and countries with large Chinese populations such as Taiwan, Malaysia and Singapore, Chinese Esoteric Buddhism is commonly referred as Tángmì (唐密) "Tang Dynasty Esoterica", or Hànchuán Mìzōng (漢傳密宗), "Han Chinese Transmission of the Esoteric Tradition" (Hànmì 漢密, "Han Mysteries", for short). It is sometimes referred as Dōngmì (東密) "Eastern Esotericism", meaning the succession of Tang Esoterica in Japan (east to China) transmitted by the Japanese monk Kūkai. Being parts of Esoteric Buddhism (Vajrayana), Tángmì and Dōngmì can be very different from those in Tibetan and Newar traditions, in aspects like yidams, dharmapalas, rituals, the main sutras, and the related Buddhist texts. In a more general sense, the Chinese term Mìzōng (密宗) "Esoteric Tradition" is the most popular term used when referring to any form of Esoteric Buddhism. These traditions more or less share the same doctrines as Shingon Buddhism, with many of its students themselves traveling to Japan to be given transmission at Mount Kōya. These three masters brought the esoteric teachings to their height of popularity in China. 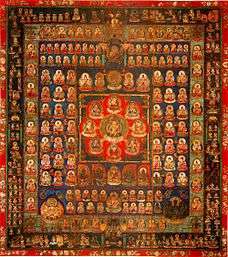 During this era, the two main source texts were the Mahavairocana Tantra and the Tattvasaṃgraha Tantra. Traditions in the Sinosphere still exist for these teachings, and they more or less share the same doctrines as Shingon Buddhism, with many of its students traveling to Japan to be given transmission at Mount Kōya. Esoteric methods were naturally incorporated into Chinese Buddhism during the Tang dynasty. 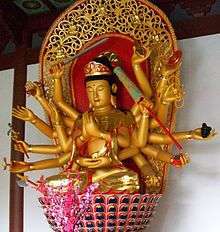 Śubhakarasiṃha's most eminent disciple, Yi Xing (Chinese: 一行), also practiced Chan Buddhism. In Chinese Buddhism there was no major distinction between exoteric and esoteric practices and the Northern School of Chan even became known for its esoteric practices of dhāraṇīs and mantras. However, Buddhist esoteric practices almost vanished from China during the Great Anti-Buddhist Persecution (845 CE) initiated by Emperor Wuzong of Tang (唐武宗). Fortunately, Master Kūkai (774–835) from Japan, came to Tang China to learn the complete esoteric teachings from the three Indian masters years before the Great Anti-Buddhist Persecution. The transmission to Japan later became Shingon Buddhism (真言宗), which is often referred to in Chinese as Dōngmì (東密), "Eastern Esoterica," because Japan is east to China geographically. Some said it is so named due to the temple Tō-ji (東寺, literally Eastern Temple) at Nara, Japan, where Master Kūkai established the Shingon school of Buddhism. Master Saichō (767-822) also brought a few esoteric teachings to Japan that were related to the Japanese lineage of Tiāntái School (天台宗), which are referred to in Chinese as Táimì (台密), "Tái Esoterica", where Tái means the Tái of Tiāntái. Dōngmì and Táimì became the two main systems of Esoteric Buddhism in Japan. During the Yuan dynasty, the Mongol emperors made Vajrayana the official religion of China, and Tibetan lamas were given patronage at the court. A common perception was that this patronage of lamas caused corrupt forms of tantra to become widespread. When the Mongol Yuan dynasty was overthrown and the Ming dynasty was established, the lamas were expelled from the court and Vajrayana Buddhism was denounced as not being an orthodox path. In late Imperial China, the early traditions of Tangmi were still thriving in Buddhist communities. Robert Gimello has also observed that in these communities, the esoteric practices associated with Cundī were extremely popular among both the populace and the elite. Since late 19th century, many Chinese and Taiwanese monks went to Japan to learn and bring back the complete teachings of Tang Mysteries passed down in Shingon Buddhism. These efforts are termed "Renaissance of Tángmì" (唐密復興). Due to this reason, Dōngmì (東密), "Eastern Mysteries", referring to Shingon Buddhism, is now sometimes used as an interchangeable term with Tángmì. 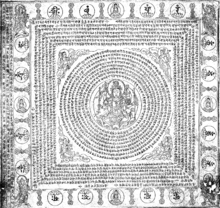 According to Hsuan Hua, the most popular example of esoteric teachings still practiced in many Chan Buddhist monasteries of East Asia is the Śūraṅgama Sūtra and its dhāraṇī, the Śūraṅgama mantra, along with the Nīlakaṇṭha Dhāraṇī. In contemporary China there is an ongoing revival of Tang Mysteries. ↑ Baruah 2000, p. 170. ↑ Sharf 2002, p. 268. ↑ Faure 1997, p. 85. 1 2 3 Nan 1998, p. 99. ↑ Wu 2008, p. 146. ↑ Shi 1977, pp. 68-71.